The New Ross Theatre Festival opens tonight [20 March 2019] with Waiting for Godot by Samuel Beckett, performed by Newport Players, and the festival continues until Friday 29 March. 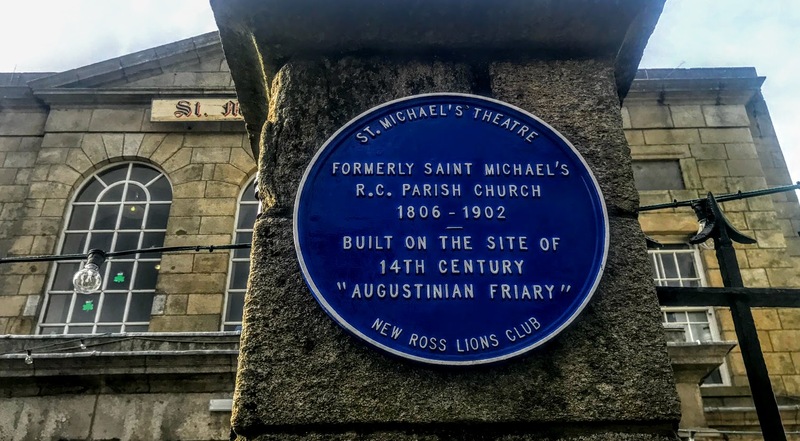 Last week, while visiting New Ross, I had lunch in Saint Michael’s Theatre, which served the Co Wexford town as its parish church for almost a century, from 1806 until 1902. The site for a new church was donated by Nicholas Loftus Tottenham (1745-1823), MP successively for Bannow and Clonmines, Co Wexford, and a grandson of Charles Tottenham (1685-1758), known as ‘Tottenham in his Boots.’ This prominent town centre site is often offered as evidence of religious tolerance in Co Wexford in the years immediately after the 1798 Rising and before Catholic Emancipation in 1829. However, the Tottenham papers show the lease of the site created family discord, and Charles Tottenham (1743-1823), former MP for New Ross, who lived in Delare House across the street, expressed his opposition to his brother’s decision. The church was built by Dean William Chapman, who was parish priest of New Ross from 1786 to 1818, and the Roman Catholic Dean of Ferns from 1801. The church was built in 1806 with a compact rectilinear or engaged half-octagonal plan, and it was aligned along an inverted liturgically-correct axis, from east to west rather than west to east, to provide immediate access from South Street. The neo-Classical frontage has a central pillared portico showing good quality workmanship in a honey-coloured granite, and a pedimented roofline. These details show the continued development or improvements of the chapel in the later 19th century. The building is an eight-bay, double-height former chapel, with a seven-bay, double-height nave opening into a single-bay double-height chancel at the west (liturgical east) end. The five-bay two-storey entrance front at the east (liturgical west) is centred on a three-bay, two-storey pedimented breakfront with a single-storey, prostyle tetrastyle portico at the ground floor. The former chapel has a replacement flat corrugated-iron roof behind the parapet. The granite ashlar walls at the front have been repointed. There is a cut-granite plinth with cut-granite ‘Cyma Recta’ or ‘Cyma Reversa’ detailed cornice on a blind frieze that is centred on pediment topped with a ball finial. There is a roughcast surface finish on the remainder of the front, with a rendered base that has roughcast stepped piers with rendered coping. On the first floor there are grouped round-headed central window with cut-granite sills, and granite ashlar voussoirs framing the replacement fixed-pane windows replacing 12-over-12 timber sash windows without horns having fanlights. The two square-headed flanking windows have inscribed cut-limestone panels with cut-granite sills, and cut-granite lintels framing the replacement 6-over-9 timber sash windows. There are round-headed blind openings in square-headed recesses with cut-granite sills, and concealed dressings framing a cement-rendered infill. The chapel was ‘improved’ in 1884-1888, producing the present composition. These works were paid for with money diverted by the parish priest, Canon John Kirwan, from an ad hoc fundraising campaign for building a new parish church. These later developments or improvements are attributed to the Cavan-born architect William Hague (1836-1899). Hague was trained by Sir Charles Barry (1795-1860), who is best known for rebuilding the Palace of Westminster. Hague spent four years in Barry’s office in London, and he returned to Ireland to develop a flourishing practice based at 175 Great Brunswick Street, Dublin, where he opened an office in 1861. He became a prolific designer of Catholic churches, designing or altering 40 to 50 churches throughout Ireland. His works include Saint Eunan’s Cathedral, Letterkenny, Co Donegal, Saint Martin’s Church, Culmullen, Co Meath, Saint Brigid’s Church, Ardagh, Co Longford, the Church of Saint Peter and Saint Paul, Monasterevin, Co Kildare, Saint John’s Church, Kilkenny, and the completion of both Ashlin and Coleman’s church at John’s Lane, Dublin, and the chapel at Saint Patrick’s College, Maynooth, Co Kildare. He also designed town halls in Carlow, Monaghan and Sligo. With the opening of the Gothic Revival Church of Saint Mary and Saint Michael as the new parish church in 1902, Saint Michael’s closed as a chapel and was handed over to the people of New Ross to use as a theatre. Over the next half century, the building had many uses, including a town hall and from the 1930s a cinema. 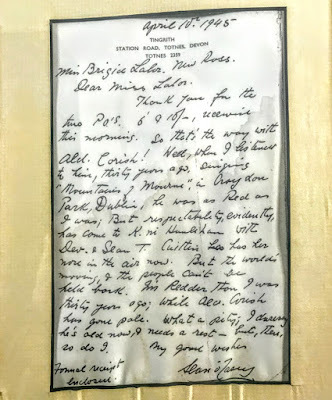 An exhibition on the stairs in the theatre displays correspondence in March and April 1945 between Bridget Mary Lalor of New Ross and the playwright Sean O’Casey (1880-1964), by then living in Totnes in Devon. 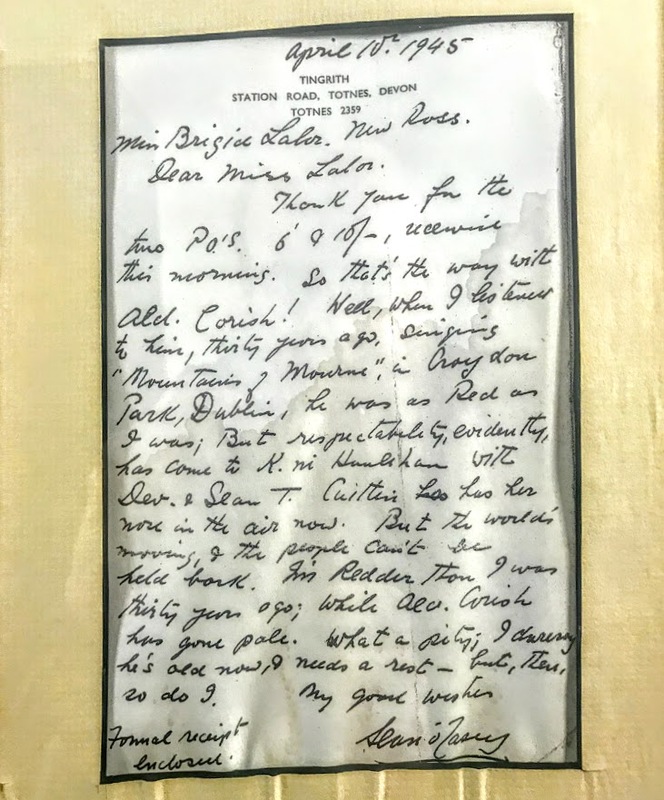 Bridget Lalor sought permission to produce one of O’Casey’s lesser-known plays, A Pound on Demand, in a drama competition in association with a local feis. Richard Corish (1886-1945), who was Labour TD for Wexford (1921-1945) and Mayor of Wexford (1920-1945), died three months later on 19 July 1945. Brigid Lalor stood for election to New Ross Urban District Councillor in 1942 and topped the poll. She chaired the council in 1948-1949 and again in 1949-1950. Her granddaughter, Niamh FitzGibbon of the Green Party, was elected Mayor of New Ross in 2013. Meanwhile, by 1957, the Savoy Cinema was in a sad state of neglect and there was a debate in New Ross about whether to bulldoze it or spend money to refurbish it. With public support for a major refurbishment of the theatre, Monsignor ‘Doc’ Brown travelled to London in the late 1950s to look at the lighting in West End theatres. The theatre reopened on 28 February 1960 with a performance by the Abbey Players of The Country Boy. The old Pantomime Society was revived, a Musical and Choral Society was formed, and two drama groups were active in the town. 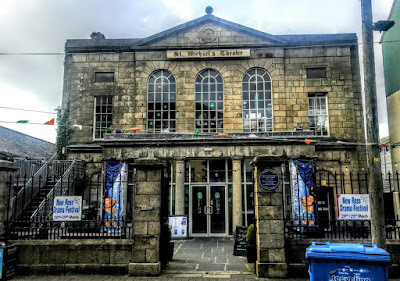 The New Ross Drama Festival and the John Player Tops of the Town played to enthusiastic audiences down the years, and the AIMS Choral Festival moved to New Ross in the 1980s. After 35 years of constant use, the theatre started showing signs of wear and tear in the mid-1990s, and, yet again, there was talk of the bulldozers. The people of New Ross rallied once more, public meetings were called, and a capital grant from the Department of the Arts was secured. The theatre closed in May 1997 and rebuilding work began. Two major finds during the renovation work included the original altar steps and a grave believed to be that of a priest. The theatre reopened on 3 May 1999 with the Abbey Theatre’s production of Love in the Title by Hugh Leonard. A significant expansion of the theatre took place in 2002 with the opening of the Visual Art Gallery Saint Michael’s, and a cinema was added in 2003. Today, Saint Michael’s is a theatre, a cultural centre and a community based arts centre serving New Ross and the surrounding district. It boasts a 300-seat theatre, a 50-seat studio venue, an art gallery, a cinema, two visual arts spaces, a coffee shop and a bar, and it is now a fully-fledged arts centre with a staff of 12. There are about 300 events a year, from drama and film to ballet and rock concerts, and there is successful youth arts programme. 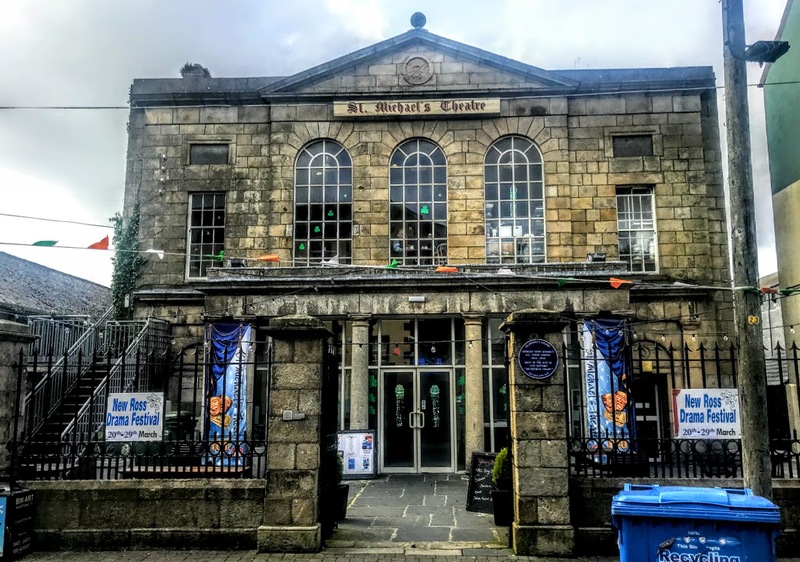 It is home to three amateur community based theatre companies – New Ross Musical Society, New Ross Drama Workshop and New Ross Pantomime Society – and has its own in-house musical society, Saint Michael’s Theatre Musical Society, which hosts productions each November. The is set back from street, and the granite ashlar piers outside have ‘Cavetto’ stringcourses below truncated pyramidal capping, and there the wrought-iron double gates have arrow head-detailing. The composition of this former chapel retains its architectural value and continues as an important component of the early 19th-century church heritage and architecture of Co Wexford.